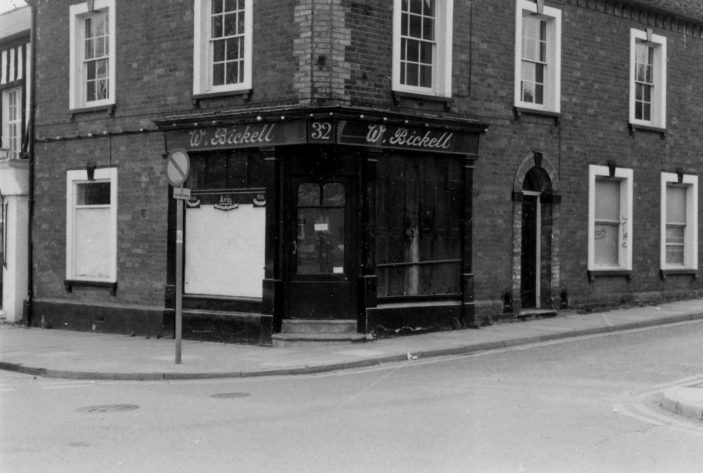 The room on the right (two windows-worth) in Orchard Road was the original location of Barclays Bank, before it moved to Eversley Lodge (68 High Street) where it remained until 2010. Confused about this photo – is it the opposite side of Orchard Road to Hawkes shoe shop? If so, I presume the shop no longer exists as this corner was demolished to make way for the one-way system. So carrying on up the road on the right hand side of the photo was the old Town Hall? Next door is Ivy House, you can just see it, black beams. I was in partnership with my friend Dennis Tait, for a while, Ivyhouse Antiques, we had a stuffed bear outside. Living in Orchard Road, I remember this shop well. It always seemed to be stuffed full of clocks, and managed by a friendly very mature lady. Near it was Hawkes shoe shop run by a couple of brothers. You would go in, they would look at your feet, go away and return with a selection of shoes to try (AND they would all fit). Amazing personal service, a hallmark of the age.